Uniscon was founded in 2009, to develop technical solutions that ensure users convenient yet safe use of the Web. Today, Uniscon is the leading provider of cloud security solutions in Europe. Our products represent a quantum leap in online security: Our Sealed Cloud invention ensures maximum security during web service application. By protecting data online and ensuring full web privacy, we have solved the greatest online security issue to date. With iDGARD, Uniscon offers a cloud based web privacy service. The service is based on Sealed Cloud technology and is already patented internationally. Today, the Company disposes of a staff of nearly 50 international experts: software engineers, security experts, marketing professionals, and business authorities. Uniscon develops technical solutions, that allow you to use the Web safely and conveniently. So you can decide for yourself what you wish to disclose. Your Trust, Our Commitment: You choose the degree of transparency you wish to transpose, depending on your contact. We ensure, in turn, cutting-edge technologies that blaze groundbreaking trails in Internet security. Karl Altmann was Area Vice President of the DACH region at Imperva, a leading provider of data and application security solutions. Prior to joining Imperva, the cybersecurity expert co-founded SINUUM GmbH, a value-added distributor of security solutions, where he oversaw EMEA sales. Microdays played a crucial role in contributing to Karl’s vast expertise, due, in particular, to its vast success and Karl’s many years of experience in the US. 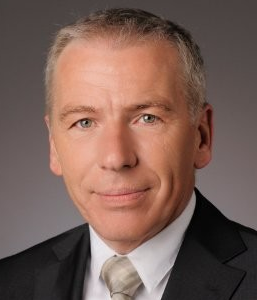 Dr. Hubert Jäger holds degrees from the University of Stuttgart and ETH Zurich, the Swiss Federal Institute of Technology. He has held leading positions in product development, innovation & product management, and sales in major high-tech companies. Dr. Jäger is also the inventor and author of numerous patents. Dr. Rieken disposes of over twenty years experience as network infrastructure and IT industry expert. He has held various leading positions in major IT and network supplier companies. Dr. Rieken also spent many years abroad in the United States, et al., heading a software company as CEO in Silicon Valley until late 2007. 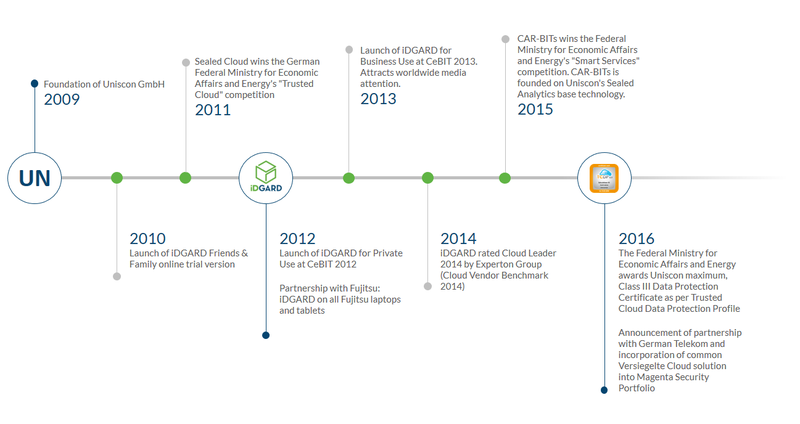 Launch of iDGARD for Business Use at CeBIT 2013. Attracts worldwide media attention. Users range from all scopes of business: manufacturing and trade, the public sector, banks, law firms, auditors & CPAs, real estate agencies, service providers, etc. Parliamentary State Secretary Matthias Machnig of the Federal Ministry for Economic Affairs and Energy awards Uniscon maximum, Class III Data Protection Certificate pursuant to Trusted Cloud Data Protection Profile at CeBIT 2016, following an audit of iDGARD by TÜV Nord. Release of Sealed Backup. Also excludes all service provider access.